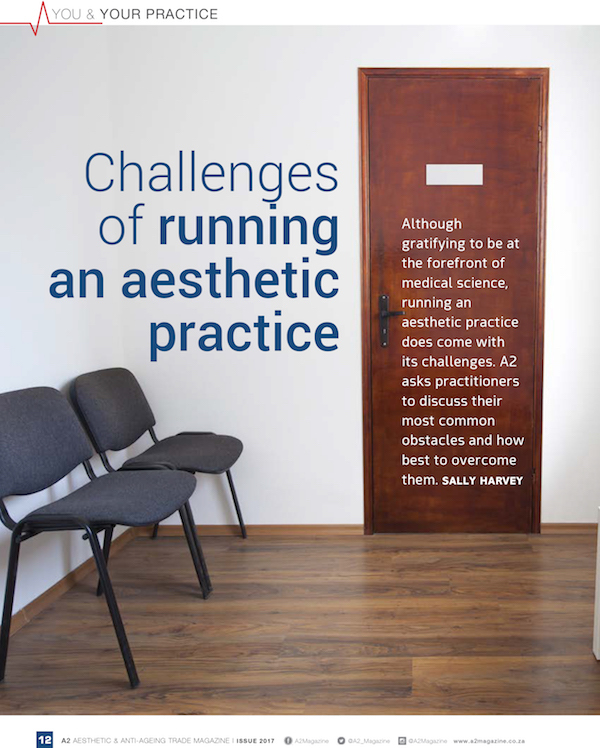 It’s that time of year again where we publish our FIFTH edition of A2, which is a trade-only magazine for those in the medical and professional aesthetic industry. This one being our relatively new ‘baby’, A2 Trade, is only printed once a year and released in the month of May. All feature content of this issue is focused on all the latest innovations, techniques and trends in the aesthetics/ cosmetics industry, for the sole purpose of educating and informing all medical professionals in this field, as well as therapists focusing on skin treatments. We therefore source topic ideas from various local congresses (based on lectures given by the doctors), news from various plastic and aesthetic associations – as well as updates from international workshops and topic suggestions from the physicians on our expert panel. 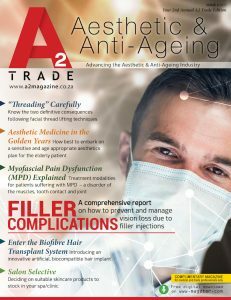 The TRADE magazine is not available to buy in stores; however, you can request us to send a copy to you (it’s FREE – in South Africa only) on info@a2magazine.co.za (WHILE STOCKS LAST), or you can download a FREE soft copy of the A2 Trade magazine for free through our A2 Magazine App on iTunes and Google Play (you need to be logged in to view the mag). We trust you’ll find value in this trade issue, and we can’t wait to bring out the next one in May 2018. 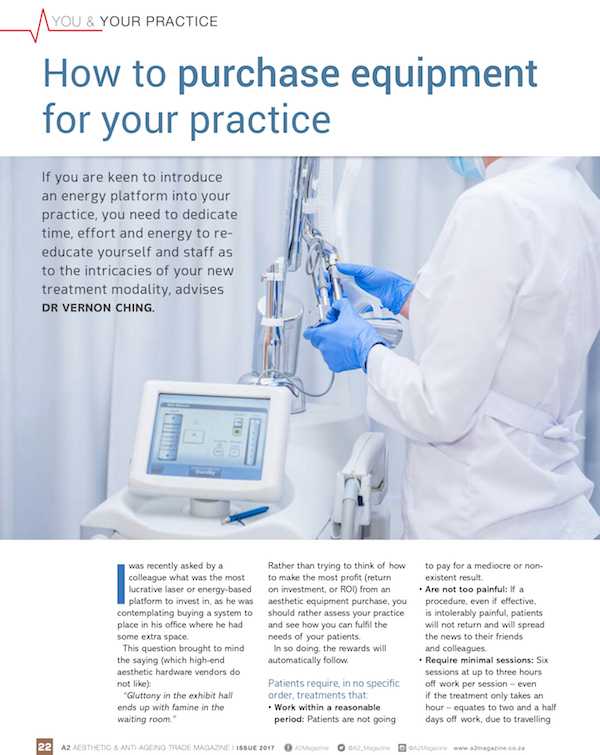 Aesthetic Medicine in the Golden Years DR DEBBIE NORVAL advises how best to embark on a sensitive and age appropriate aesthetics plan for the elderly patient. 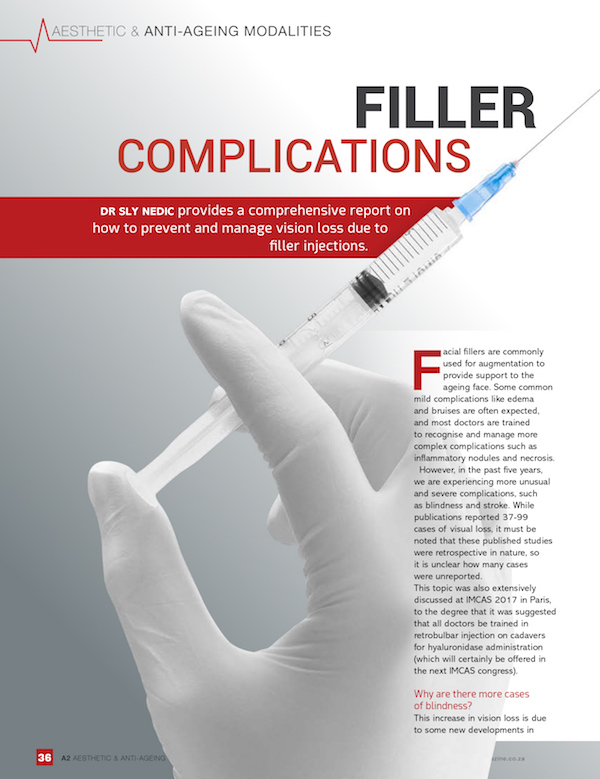 Filler Complications DR SLY NEDIC provides a comprehensive report on how to prevent and manage vision loss due to filler injections. Enter the Biofibre Hair Transplant System DR REZA MIA introduces Biofibre – an artificial, biocompatible hair implant that addresses diffuse hair loss, thinning hair and receding hair lines. 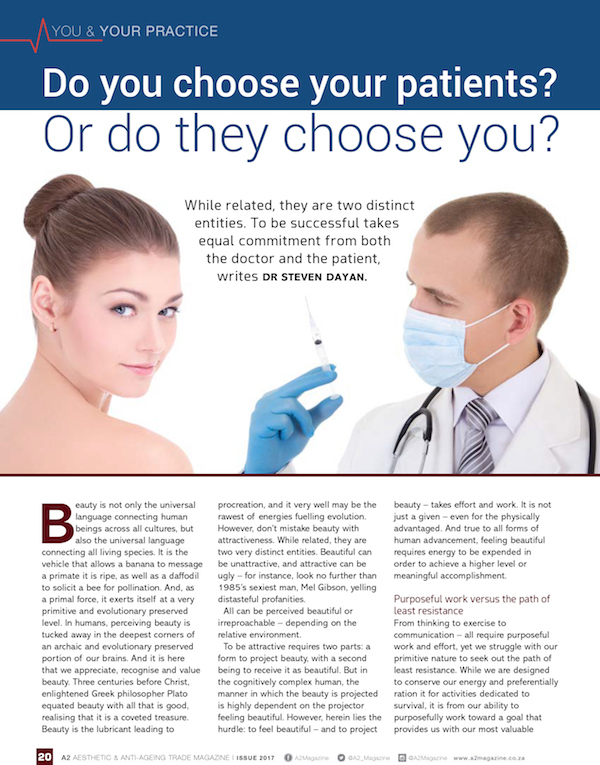 Regional Anaesthesia of the Face in Aesthetic Medicine DR ALISTAIR MCALPINE discusses how the combination of patient selection, the use of the correct anaesthetic agent and applying the correct technique is vital to obtain safe and adequate regional anaesthesia. Patterns for perfection – DR MICHELLE EMETT advises how to choose and develop the best thread placement patterns to ensure optimal results in lifting. The Telemore Effect – DR CATHERINE DAVIES explains how part of the ageing process may lie in our telomeres. 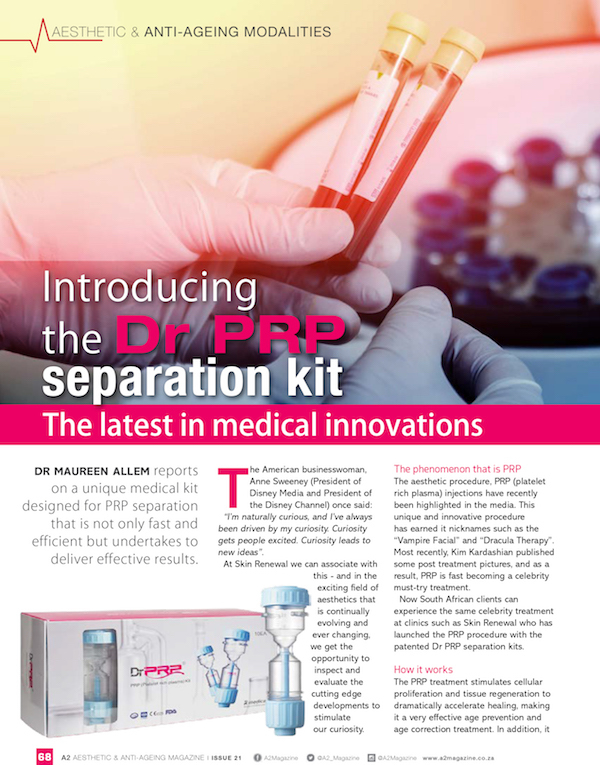 Introducing the Dr PRP Separation Kit DR MAUREEN ALLEM reports on a unique medical kit designed for PRP separation that is not only fast and efficient, but also undertakes to deliver effective results. When the Jaw Pains the Head: Myofascial Pain Dysfunction (MPD) Explained Also known as ‘The Great Imposter’, MPD is a disorder of the muscles, tooth contact and joint, with patients displaying numerous symptoms such as head, face and neck pain. DR CRAIG PEARL and DR CHELSEA CAHI advises on treatment modalities thereof. The Orthotropics Application – DR ZAK SCHABORT explains how applying orthotropics in both adult and pediatric dentistry can not only enhance the patient’s smile, but additionally improve their facial profile and functionality. Lipodystrophy: The cause and effect DR GABRIEL DOUCAS sheds light on the different types and categories of Lipodystrophy, a medical condition which refers to the maldistribution of fat throughout the body. “Threading” carefully in the modern aesthetic journey DR NERINA WILKINSON discusses two definitive consequences following facial thread lifting and filler techniques. Facelifts in Perspective DR PEET VAN DEVENTER stresses the importance of offering emotional support to your patient after their facelift procedure – which is as essential as the operation itself.